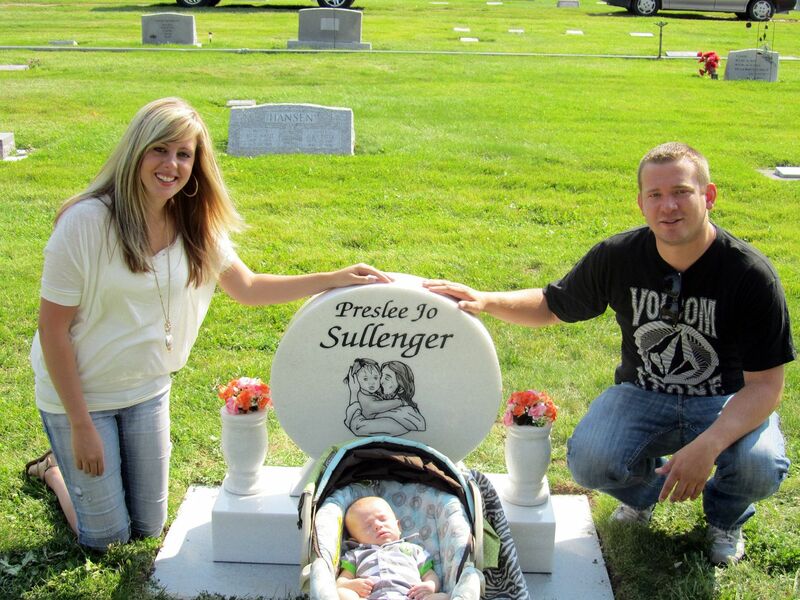 After a very long wait, Preslee's headstone was set today. It's been a little bit stressful because there were a few problems getting the granite out of Tibet. 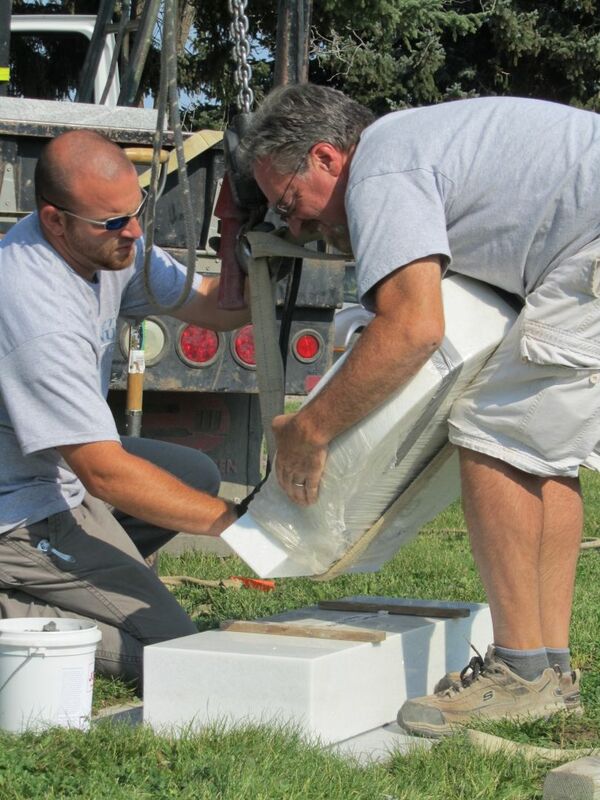 When we placed the order we had no idea how rare white granite is. 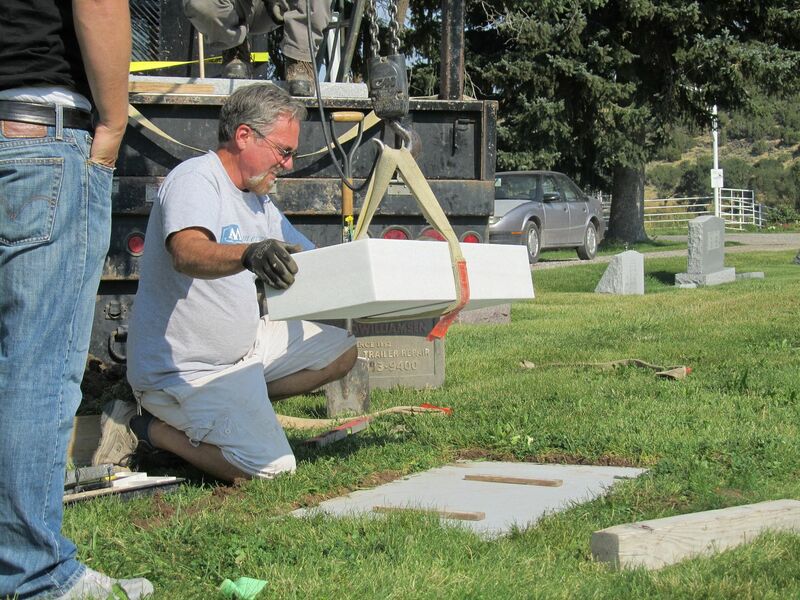 We were afraid we weren't going to get the headstone in before winter and would have to wait till next spring. But everything turned out great and we LOVE it! It's perfect. We went and watched the guys from American Monument set it. I've been kind of fascinated with all of this headstone business. 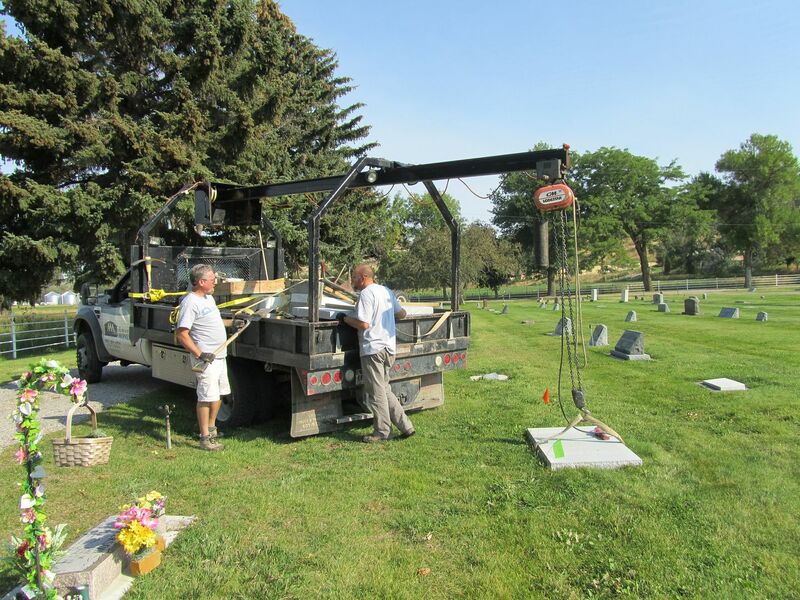 Who would have thought Preslee's granite headstone would be in Tibet a couple of months ago and shipped to a few different places in the US before making it to the cemetery? The two guys who set the stone were incredibly nice and we were glad we were there while they were working. My parents also made it there and took us to Big Judd's afterward. We are very glad we went with the drawing. We're extremely happy with the results. Its so beautiful and I'm glad you were able to be there when they put it in! We love you guys and we will have to go visit when we are up next! Wow, you are soo tough! This post made me cry. Thank you for all of your inspiration...I feel like I know you even though I don't! We are living in Rexburg too, and I think about you a lot. In fact, your blog was brought up in our relief society last week, and everyone was really touched by it. Thanks for you strength and optimism. I'm glad the headstone turned out the way you wanted it to. It's just beautiful. 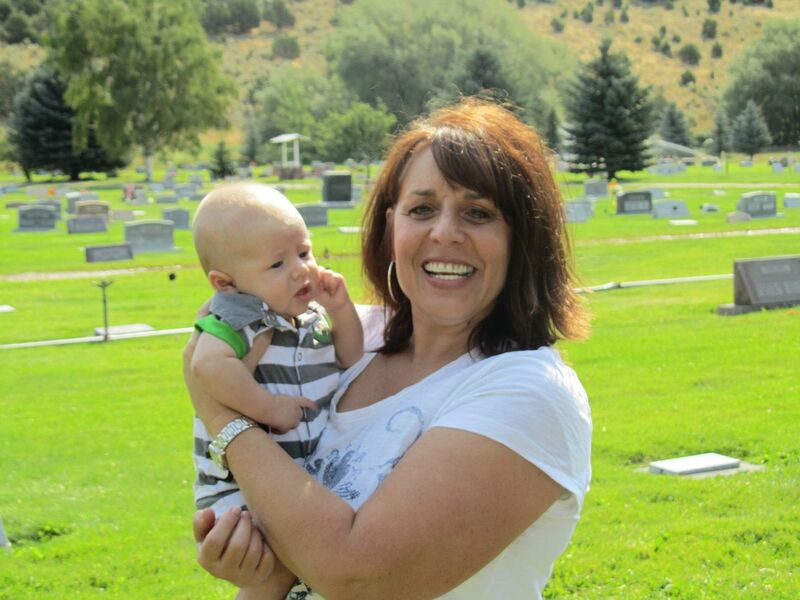 My son's headstone was set 5 months ago but I just haven't been able to bring myself to go view it. I want to. But it's hard. I love that you can smile in the photos above. All I seem to do is cry when I visit. Ashley, I too am a silent follower to your story. This post brought back memories of having our own son's headstone put in. It's an indescribable moment. Thank you for sharing. It's beautiful! The drawing is perfect! 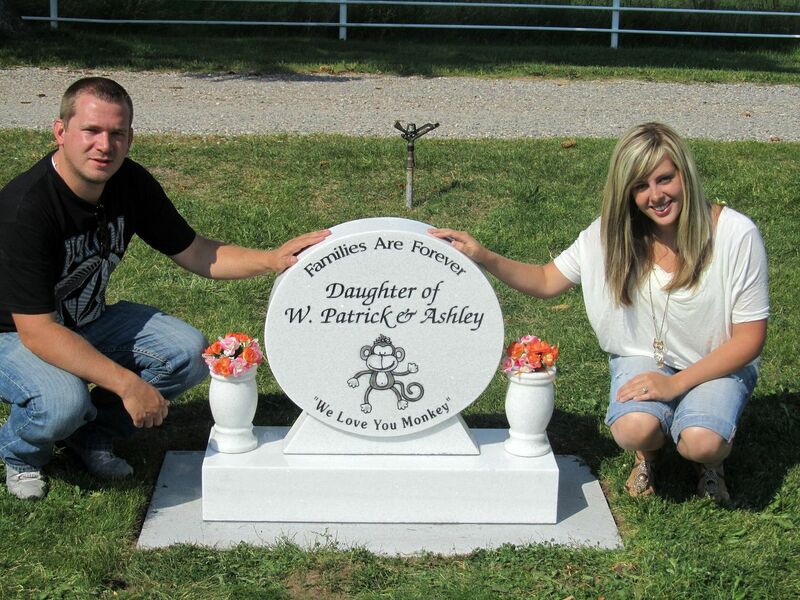 Ashley.. Preslee's headstone is perfect! It turned out beautiful! I LOVE the white granite and how the etching turned out! We love you guys! Beautiful! The image makes me cry, but tears of happiness! What a lucky girl to be spending her days with Jesus. JUST beautiful!!! I love it! Love the drawing of Press and Christ. So excited you finally have her headstone. Loves to you. I love the white granite. I love that Monkey! You guys did a great job picking it out. It looks beautiful. It is absolutely beautiful! The white granite is just stunning! What a perfect way to remember your sweet little angel. May God continue to bless your amazing family! It is so beautiful! I'm so glad that they finally got it in for you. It is hard to have that final item placed and done but also a huge relief that their resting place is marked and made the way you want it to be. I love looking at Gabriel's headstone and love that it's exactly what I wanted. Someday I hope to make it up and see it in person. It is gorgeous. I absolutely love the picture. Everything about the headstone is beautiful! I am so glad it was finally able to placed. GORGEOUS!!! I kinda got teary-eyed while reading this just for personal reasons, but I love this. I too never realized how interesting headstones can be and the meaning behind them. Whenever I visit my friends grave sometimes I just stay and look at all the other headstones while I'm there. I love the headstone, it is beautiful! Ash it's beautiful. It's totally perfect. Oh wow it's so gorgeous. I don't usually leave comments but I am an active reader. The moment I saw the picture of Preslee in the arms of Christ, I couldn't help but get choked up and teary eyed. It's beautiful and couldn't be more perfect for your sweet little girl! I absolutely love that picture of Preslee with Jesus. Is that something that can be drawn again? My friend's little 2 1/2 year old daughter passed away in a drowning 3 months ago..I know she'd love something like that. Its sooo perfect Ash. I love it so very very much. I have been thinking about you so much lately and want you to know I love you. I absolutely love it!!! I am extremely attached to that monkey!! What a darling thing to add! Glad a little more weight is lifted off your shoulders ash and Pat!!! Yea!!! So happy that it is in! It looks amazing! You guys did a really good job picking it out. (BTW I missed seeing you at church on sunday. We were there for Jared and Rachel's baby blessing. The ward sure has changed. I couldn't believe all the people who have moved away! ..... We need to do a girls night soon! Kris has been in Brazil for over a week and doesn't get home till friday. Hopefully after that I will be free to do something.) Anyways....just wanted to let you know how glad I am that the headstone finally got finished. That drawing is fantastic. What a great gift. I'm glad you're happy with the result--you deserve it. Thank you for strengthening so many strangers through your strength. WOW! I can't get over how beautiful it is! Stunning! I'm so happy its finally done!! Love the drawing! I know she is in the arms of our Heavenly Father! I have to just say, "Beautiful." I love the drawing. This is Beautiful!! Ashley I am in constant awe of what an amazing woman you have become! You are so strong and such a perfect example of what a mothers love should be! I hope you know I think about you and your family everyday and will always have a prayer in my heart for you! I love the headstone its so pretty! Ashley it is beautiful!! Great job on choosing the drawing, it looks o wonderful. I know she is smiling down from Heaven, and watching over your family! Ive followed your blog for a year now, and I feel so lucky to have gotten to know you through your blog. Your family is always in the back of my mind, and you are such an amazing person!! Im from Rigby, you know some of my friends, possibly my parents? I just wanted to say, your an inspiration. Ive used your quote "I can do hard things" a lot. Thankyou for sharing so much with us! it is absolutely gorgeous! the nicest headstone i've ever seen. i love the monkey and "we love you monkey" on the back...so personal and special! this will not be the last thing you do for her...you will find wonderful ways of honoring her for the rest of your lives. It is so beautiful! My dad has his own monument company here in Arizona and i love all the different places these stones come from!! I've even seen some come in from India! They r rare and beautiful!!! So glad u have it placed now!!! I'd love to see it in person I can only imagine!!! Luv your sweet family! We still keep u in our thoughts and prayers! It is simply beautiful. I love the white granite. So rare, as are you. So gorgeous! Can't wait to see it in person. I love that it sparkles :) We love you guys! Oh my goodness Preslees headstone is so beautiful and pure. I love the drawing and the white granite. I truly believe that photo represents her now. Smiling in Heaven. You and Pat are very strong. I still pray for you often. It's beautiful! It brings tears and takes my breath away. I'm glad you were able to be there. The drawing is perfect. I'm at a loss for words. It touches my heart. It is beautiful. So happy that it was up before winter. You are still in our prayers. It is very beautiful! I cried through your post...I am in awe of the strength you and Pat have. Such a testament to God's power! I'll be praying for continued peace for your hearts. It's beautiful. That drawing is just wonderful. Words can not begin to describe how beautiful the stone is. I continue to pray for peace for you and your family. Oh Ashley, it's BEAUTIFUL!!! I had no idea about the white granite either! I LOVE it! And the picture is beautiful as well! We are heading to Jackson Hole for our anniversary again this year in just a few weeks! We will have to stop and see this beautiful thing in person! Ash. I'm so excited that you finally have your headstone. It is beautiful! It makes me that more anxious to get Jayci's done and up! We are working on the rough draft but uh... I ended up not liking the first stone that I picked once it was finished so we are making a new one... Thank goodness the owners love us! Anyways thanks for the comment on my blog earlier... I accidently hit delete instead of publish on my phone( oh it makes me mad) anyways Thank you and I love seeing your spirits so high! It really is beautiful. WoW! Is what came to mind when I saw it. You two are pretty tough even though you may think you're not. Absolutely beautiful. I love the picture. How perfect. You two did a great job designing it. It's beautiful. Glad you were able to finally do this for Preslee. It's Beautiful. Love the pictures on it. So special. Ashley, I've been a silent reader since her accident. I can't believe how beautiful it is. I love it. I'm sure your one proud mommy! Your work isn't done with her. Your conversations will continue, you will need her more than you think! She is smiling down on you thanking you! She is one beautiful little angel and Ledger is one lucky little man to have you as his mommy! I wish you nothing but the best and I will continue to look for updates on your little man, I love reading about you and your cute little family! I think your spiritually stronger than I could ever be, and your the mom that I inspire to be like! Heavenly Father has truly blessed you! Good luck and best wishes to you and your fam! xoxo! Sam! 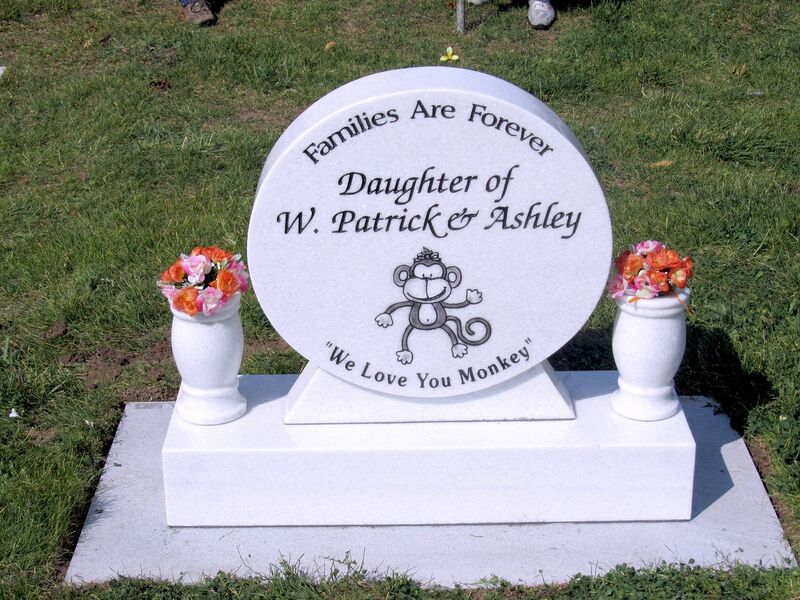 Ashley the headstone is so perfect and beatiful. The picture brought tears to my eyes, it was a perfect choice! You and your family are truly amazing people. I don't think that the headstone is the last thing you will do for her. I think living well is also something you will do for her each day. When you meet again, she will want to hear some good stories about how you have lived well and filled your lives up with adventures and experiences big and small. not sure if I have ever commented on your blog, but I just wanted to say how beautiful this headstone is..for a perfect little girl! It's an amazing headstone. Don't forget that you get to do things for Preslee every day - by living righteously so that you can be a forever family! That is such a beautiful headstone. Love it. 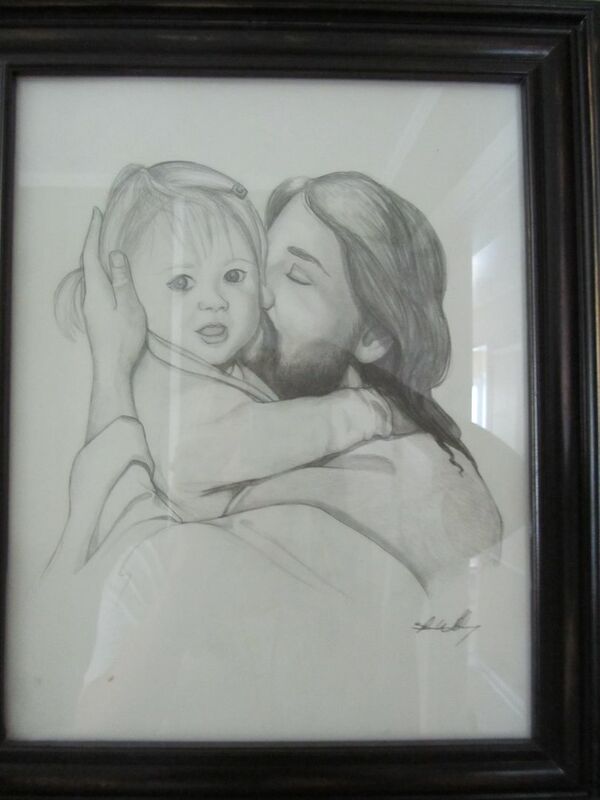 The drawing is beautiful-- how can you not smile when you see heavenly father with his arms lovingly holding a little one-- you are such a great example to me- I am a mother of 3 kids, and feel inspired by your blog. Thank you for sharing. I'll bet she LOVES it. Preslee's stone is beautiful! I have been reading your blog since the accident and have learned so much from your faith. The reason I am writing to you today is not to bring more heartache but to be honest with someone who deserves to know the truth. I know a lot about stones and couldn't resist but to go see Preslee's stone when it was set. It isn't white granite like you wanted. 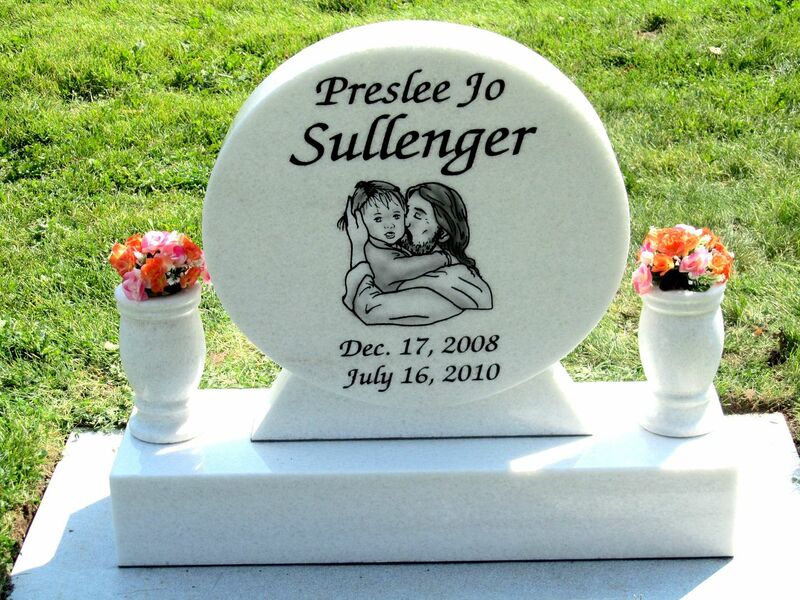 Preslee's stone is polished marble. I am positive it's marble. It is still a beautiful stone. I just don't want you to be disappointed later. What an amazingly beautiful stone to honor your amazingly beautiful daughter of God. I LOVE LOVE LOVE the monkey on the back. SO CUTE! That picture on the front is so touching and almost brings me to tears. I truly picture that Preslee is in his arms, snuggling him and also thanking him for such amazing parents on earth. You guys and your strength continues to be such a strength and reminder to me to do everything I can in my power to not take a single thing for granted. Because of you, I have started writing a journal. I NEVER write in a journal, NEVER. But now, I can see just how much you wish you had written more about Preslee. So I now think of her every night when I don't want to write.. and it encourages me to do it. I thank you for that. Again, the headstone is a purely beautiful, just like Preslee Jo. Hopefully you'll check this, but to the anonymous comment who said the headstone is marble, will you please e-mail me? ash_sidd@hotmail.com Thank you! I love it! Oh my gosh it is beautiful! And it made me tear up. Especially when I saw the back side of it. So special! It's beautiful and the back is absolutely priceless. Ashley I have been following your blog for the last 6 months or so. So impressed with your and pat's faith and understanding of our heavenly fathers plan. I hope if I am ever faced with such trials I would have your faith. The headstone is priceless! Thank you for touching my life through this blog. To little Presley thank you for sharing your mommy with us, what an amazing girl she is! I've followed your blog and story, and I just want to tell you how amazing and strong I think you and your husband are!! AMAZING people! !The Two of you truly are a strength and inpiration to those around you and everyone outside you!! Its perfect! Thanks so much for sending us a picture that day! Your little guy is so darn cute! Love you guys! Hey Ash! Just wanted to tell you how happy i am you finally got your stone it looks beautiful! You guys did a great job with it all. I read a comment earlier about the stone not being granite, my husband works at a granite company and if it was important for you to know i could have him look into it....hope all is well and its fun to see you so happy! Love you guys! I want you to know that I love reading your blog. Although, you do not know me, you make me a better mother. Whenever I'm frustrated with motherhood or my little boy, I can always find amazing comfort and insight in your blog. Your children are beautiful.